I won this book for free in a pirate-themed contest. ARRRRR! 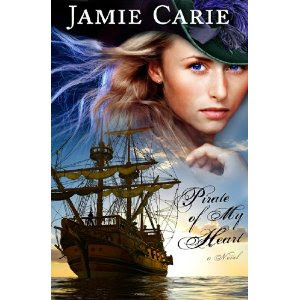 There is actually very little pirating; only a few chapters even take place on the sea, with the romantic lead being a merchant captain, not a pirate at all. Despite that, I found it enjoyable…if you like historical romances full of misunderstandings, with a bit of classic melodrama, this is a perfect book for you. Nice little historical tidbits, though the main pull of the story is the romance. The main issue I had was that the editing felt like it was done by someone younger than me, and I'm only in my early 30s. I'm honestly sure if that means the market is changing and I'm the one with hangups, but the few Love Inspired and other romances I've read didn't have these techniques. The word "alright" is universally used for "all right," though it's my understanding that "alright" is a relatively modern way to spell "all right." (As recently as the 1990s I recall a Reader's Digest article nothing "alright is never all right.") That word still drives me up the wall to read. I was shocked to read the word "Noooo" multiple times--my English teachers wouldn't even let me put a question mark and an exclamation point both at the end of the same sentence, so I can't imagine what they would have done with that. And I couldn't find any evidence of the name "Kendra" being used prior to the 1940s, let alone the 1700s (though I'd like to be proven wrong there). I don't know if this book was rushed to market or not, but I feel like another pass of editing would have strengthened the style and perhaps even made some plot points a bit more realistic. Shouldn't bother any readers who aren't also writers/editors, and I'll bet a lot of writers/editors won't have a problem either. It just jarred me. Still, there was a lot to like. I loved Kendra's playful accusations of Dorian being a scoundrel and such. As I noted, despite the title, there is little piracy and the male lead is not a pirate except in a very figurative sense. Could be just as well since REAL pirates aren't so romantic. I was surprised to find myself liking Kendra, despite the fact that she is one of those women who is the most beautiful woman you've ever seen and who can win every heart. An entertaining escape with a page-turning conclusion!